The cross trainer is a truly versatile piece of gym equipment. Allowing you to workout upper and lower body together or independently, as well as being able to choose the level of intensity for that workout. The 4 Series 4 CT from Star Trac is a high quality, commercial grade ellipitcal trainer that won't let you down. The elliptical trainer is perfect for most gyms and studios as it provides low impact workouts. This 4CT model comes with full colour flat panel display, the quick select adjustment keys for resistance as well as a 51cm stride length. You also get a personal fan, pre-progammed workouts or you can just get on and workout. 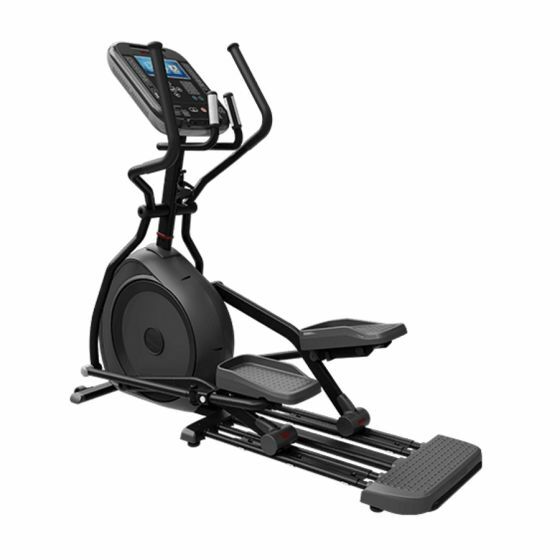 Whether you're looking for the home or for your studio or gym, the home or light commercial 4 Series 4CT cross trainer from Star Trac is a very durable and worthy elliptical. Elliptical trainers are biomechanically helping to replicate the natural running and movement pattern, whilst also providing the upper body workout with the bull horns. The 4 Series from Star Trac offers studios, homes or personal trainers a high quality piece of cardio equipment that can stand up to repeated use over many years. From the upright bike, treadmill or recumbent bike through to the 4CT their machines are renowed and trusted. As well as getting a light commercial cross trainer for a lot less than it usually costs, the benefits of a cross trainer in your home or gym really stack up if you can only fit or afford one piece of cardio equipment. First and foremost the cross trainer provides low impact exercise which is perfect for rehab or for those getting back in to their fitness from a break. You get the dual action of lower and upper body and also foot and leg motion thanks to the Soft Trac pedals. Finally, if you need a weight bearing exercise that won't end up injuring you, then an elliptcial trainer is perfect as you can make the workout as intense as you wish. You may also be surprised to hear that you can also burn a lot more calories over the same period of time than with say an upright bike or a treadmill.